Just two weeks ago, the good folks from Drunk Off Shoes kicked off Sneaker Lifestyle 2013 in Montreal. I spent a week leading up to the event enjoying their beautiful city- eating a lot of great food (the smoked meat poutine at Main Deli Steak House guarantees that I’ll be back! ), meeting a lot of great folks from the Montreal sneaker scene as well. Some of you I’m sure saw the highlights from my Instagram feed. Friday the 17th we were at SubV for an official “Army of the Undeadstock” book signing, brought to you by Drunk Off Shoes as well. It’s there that I had a chance to meet up with SneakerHeadsMTL, check out this video interview we did out front of SubV. Big shoutout to David & Jason! Reebok sponsored a Live Cut of the Answer IVs and thanks to Blunts & Kicks you can see just how it went down. Thanks to DJ Groove for playing some great Hip-Hop while I chopped down a pair and began brainstorming the Answer IV mask. The mask was raffled off and won by @freakyfirststep! 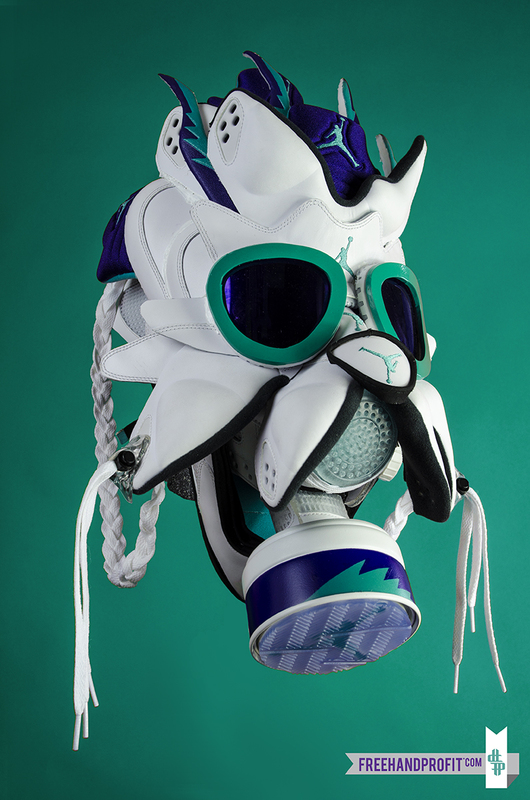 I officially unveiled the Grape V mask at Sneaker Lifestyle 2013 but now it’s your chance to see it.This piece was commissioned by Drunk Off Shoes, they sacrificed a pair of the 2013 Jordan Retro Vs – I had been looking forward to making a mask from one of my favorite Jordans so I also sacrificed a pair. 8th Bit Tees designed by Freehand Profit for 8 and 9 Clothing. Click here to get yours! “Whuuuu?”……. Some of you may be wondering how that makes sense. Most masks requite only 1 pair to complete but on the rare occasion that I’ve used 2 pairs in the past I’ve been very happy with the results. Having more materials allowed me a number of creative freedoms. It meant that I got to wear my ’06 Grapes in the photo shoot too. 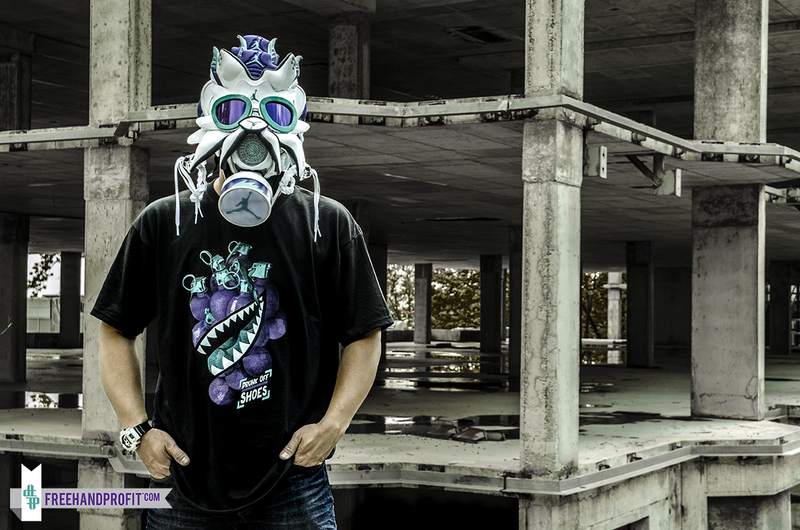 Both of the shirts worn in the Grape V Mask photo shoot were designed by Freehand Profit. The “Grape Grenadier” tee is available from The Drunk Off Shoes Online Store. The “8th Bit” tee is available in a number of colors and is available from 8and9.com! This mask was a beast, heavy as all hell but it carries a presence and you can feel it when you’re behind the mask. With the help of the Fat Chance Crew we shot in LA, Sebastian Bleak assisted with photography while we shot in La Cienega Heights and Betsy VanDeusen took the shots Downtown. 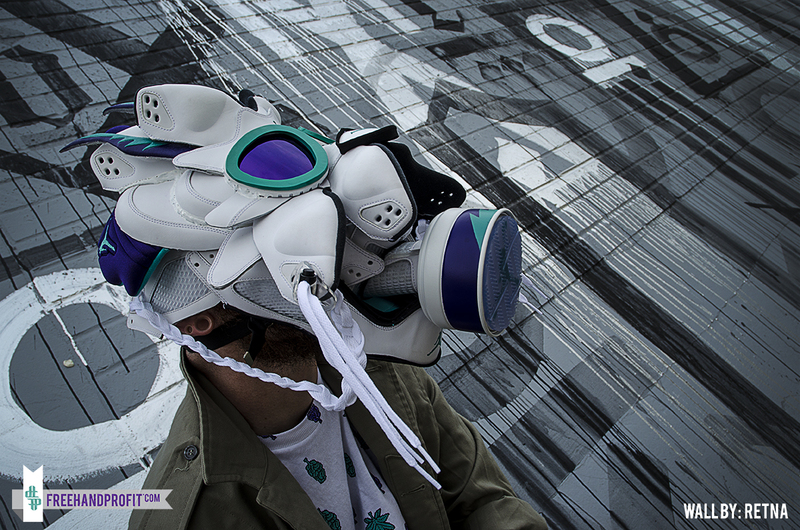 While in Montreal I also photographed Jamie from Drunk Off Shoes wearing both the Fire Red IV mask and the Grape V Mask. The wall seen behind me was done by one of my favorite graffiti/street artists- RETNA. His unique letter forms are a truly unique visual language, appearing equal parts graffiti, ancient scripture and foreign (possibly other wordly) alphabets. If you’re not familiar, best get familiar. I see his work often in LA (as well as other cities I visit like Miami & San Diego) and I’m never disappointed. 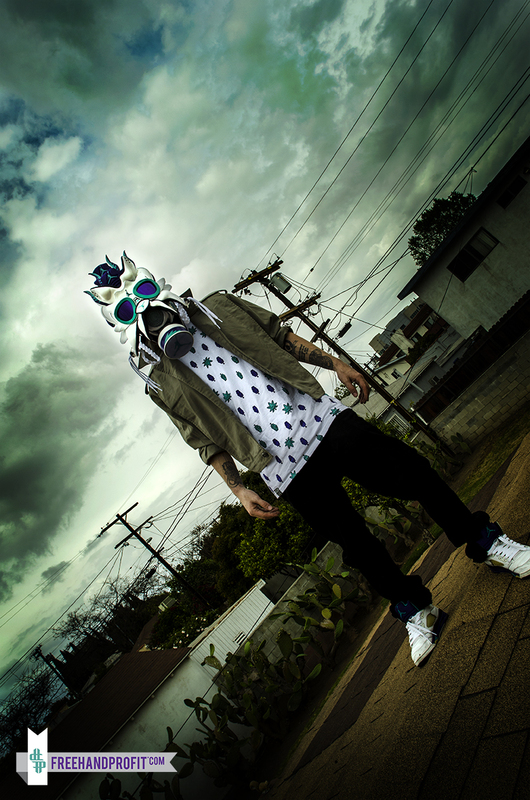 Hey were can I but one of these gas masks?